We’ve been home for over two weeks now and I’ve finally finished editing the 4000+ raw image files I brought back with me. The girls are still anxious to get in the car and go places. I thought maybe they would be tired of travel but no, anytime, anywhere, they are ready. They were great traveling dogs. They got along with everyone they saw on the trail and in the campgrounds and everyone that met them said they were well-behaved dogs and SOOO good looking. We all kept each other warm during the long cold nights, piled up under wool blankets and down comforter. The car and the tent trailer worked well for over 4000 miles and I was happy to have a trouble-free trip. People worried about me traveling alone (what? dogs don’t count?) but we never had any problems along the way. No one ever stepped on a cactus or got bit by snakes. Good luck? Good karma? It all just felt right. And the endless sunny days and star-filled nights. Oh my. My favorite part of the trip was all of the hiking in Utah. It was fabulous and really, I only just touched the surface of the places I visited. There is so much more to see. I had intended to take selfies all along the way but I only managed one. It was at Fisher Towers. And this is my last photo from Utah. Morning over Canyonlands. 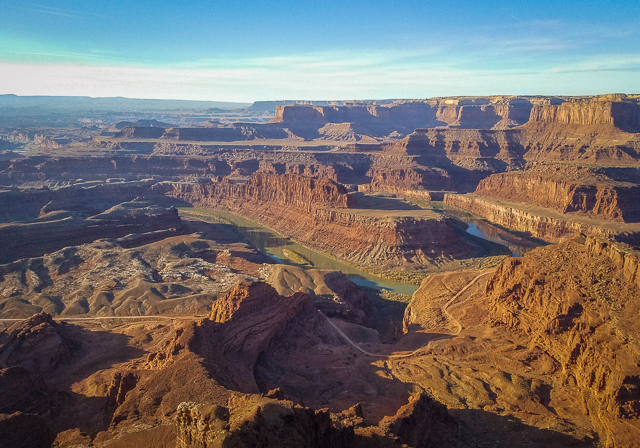 We were lucky to find Dead Horse Point State Park not busy. It is the most popular state park in Utah for good reason. 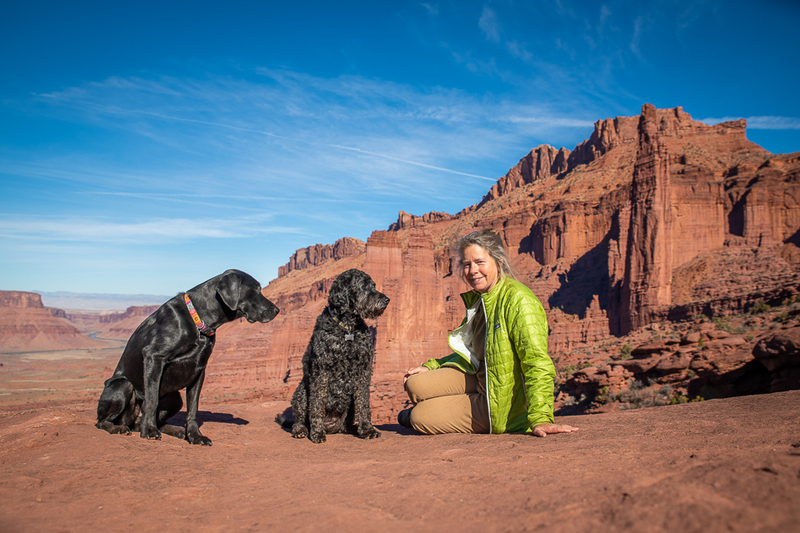 It sits high above the Canyonlands National Park with incredible views down into the Colorado River’s winding canyon. The layers of rock are highlighted by the rising and setting sun. It’s a popular place with photographers and I saw a number of them with their tripods at sunset. After dark, the place had wonderful dark night skies. No ambient light in sight from our camp. The moon was bright enough that I did not need my head lamp to get around at night. And it was very quiet. After staying at RV parks near busy highways, it was a relief to be in such a beautiful place again. Those ponds are solar evaporation ponds for a potash mine. We woke the next morning to even colder weather. It was 11 degrees Fahrenheit. 11. In a tent trailer. And the forecast said it was not going to get warmer. So I fed the dogs, made a quick cup of coffee and some tea in a thermos and two PBJ sandwiches and quickly folded up the camper. In near record time. I looked at weather forecasts for other parts of New Mexico, SW Colorado and into Utah. The warmest place was Moab so we headed north. It took much of the day but we pulled into the sprawling tourist town around 4:30 and found a dog-friendly hotel and settled in for a warm night. In the morning we drove to Fisher Towers for a wonderful hike in the red rock country. It was a great hike with panoramic views over the Colorado River and into the rugged Onion Creek area to the south. The towers themselves are incredible pinnacles of red rock, attractive to rock climbers. Now you can see them. Hurry – you wouldn’t believe what’s around that corner! Can you see the blue spot? That’s a paraglider or something like it. Why would they want to land there? Can you see the guy on top of the rock? Now can you see him? Now there is a person on top of the middle rock. In a world of little rain, much manages to live and thrive in the desert climate of the southwest. Junipers and pinyon pines, shrubs of all sorts, cacti, lichens of all colors – even blue, and I imagine all sorts of flowering plants that show themselves in the spring. And in an ephemeral pool, I found tadpoles! So somewhere there are frogs or toads, maybe under the crust of a dried up pool. Even the soil is alive with cryptobiotic crust composed of algae, fungi and cyanobacteria. The canyons’ rock walls erode away little by little contributing soil continuously. Roots inch their way into cracks, enlarging the cracks and storing moisture and soil for future growth. The landscapes of the southwest are expansive and sometimes, you need to travel by car in order to begin to take it in. These images are from the scenic byway – highway 95, the Moki Dugway and the Valley of the Gods. These have weathered badly and also been defaced even though they are quite high and to me, seemed inaccessible. Parts of the rock have sloughed away.